Craftworks Toolbox Refrigerator | OhGizmo! If the thought of installing a full sized fridge in your perfectly maintained garage seems tacky or out of place then you’ll like this alternative. The Toolbox Refrigerator from Craftworks is designed to look exactly like a rolling tool chest complete with rugged red exterior and faux drawer pulls. But the whole front opens up to reveal a fairly decent sized interior (4.4 cubic feet) where you can store snacks and drinks. It even has interior lighting for those late nights and a locking mechanism to keep the kids away from your grown-up beverages. The top of the fridge also functions as an easy to clean counter for making sandwiches or other more ‘elaborate’ meals. Now all they need to do is release a Toolbox Toilet and you’ll never have to go back in the house again! 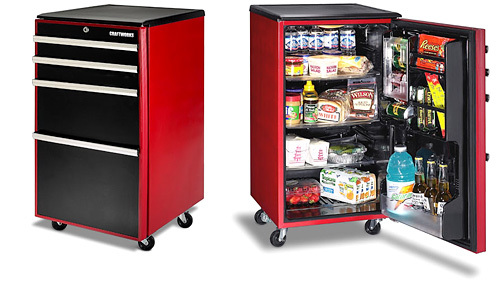 The Toolbox Refrigerator is available from After 5 for $349.99.